I like to buy apples in bulk. We can go through a LOT of them in this house. But, occasionally I will have them set and become soft. The family is not as fond of them then. I know... it is a bit spoiled, I suppose. All is not lost though! They are not to be thrown out to the chickens, pigs or cow! They can still be used! Last night I gathered up all the overly soft apples and cut them up into chunks. Piled them up in my crockpot and turned it on low. I added about a 1/2 cup water and 1/2-1 cup sugar (sucanat or organic cane juice crystals) to the crockpot and let it go. I will take my stick blender and go in and make it smooth this morning and it's ready! If you choose, you can also make this spiced! Take a little cinnamon or some cloves. It's a lot like my crockpot apple butter recipe, but you don't add any water to that. 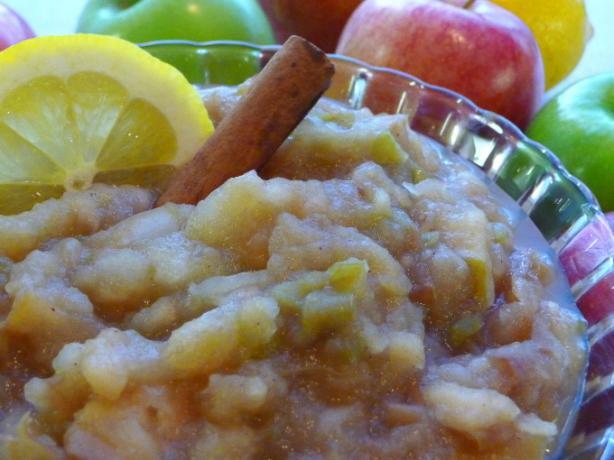 This morning we can have warm applesauce with some boiled eggs and toast for breakfast! Quick, easy and now you can just throw out the cores and the peelings to the livestock. Everyone gets a treat! We do the same in apple picking time. My kiddies love it on the oatmeal.